The Dash Receiver is a polymer modified, one-coat pebbledash adhesive, offering superior adhesion to dash aggregates and a long-lasting finish. The pebbledash adhesive is extremely flexible, so the risk of cracking is significantly reduced. It is highly durable and breathable, ensuring a long lasting and reliable finish. The EWI-235 can be used to create a dashed surface for render-only systems, as well as in external wall insulation systems. This is a highly versatile pebbledash adhesive that comes in a variety of colours to achieve a stand-out finish that can suit all tastes. 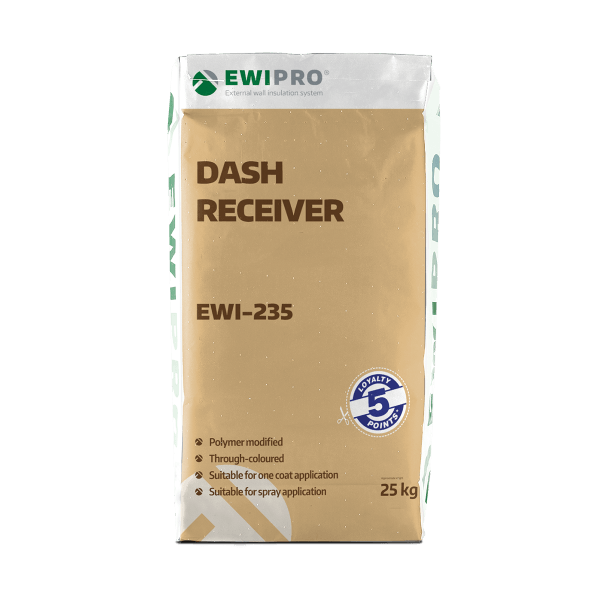 The Dash Receiver is a polymer-modified, dry-mix, through-coloured render. This product is intended for use as a dry dash receiver to create a pebbledash effect – dash aggregates are simply thrown onto the adhesive to create a durable render finish. Unlike our ready-mixed renders, the product comes as a dry-mix, so it requires mixing with water prior to application. The pebbledash adhesive comes in 25kg bags and needs mixing thoroughly with 5.5 litres of water before use; it is also suitable for spray application and one-coat application onto brick or blockwork. Dash Receiver should not be applied in rain or humid conditions, or if wet weather is expected before the adhesive has set. EWI-235 should be applied in temperate weather and should not be used in temperatures above 30°C. Setting time is dependent upon environment and humidity. The Dash Receiver will reach optimal strength after 28 days. EWI-235 should be mixed with approximately 5.5 litres of water per 25kg of dry mix.